It's Christmas Day! Season's Greeting to all my readers - I hope you are all having as wonderful a day as I am! We have plenty of snow and ice to add a seasonal feel to the day, but almost everybody I have spoken to over the past few days is fed up of the cold weather. I have even heard people welcome the fact that heavy rain is coming! We're never happy. 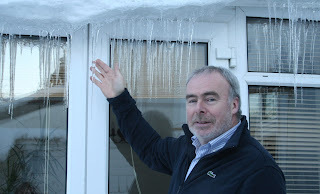 Roma took the photo to the right today - these icicles are over a foot long and are hanging from our Conservatory. I will be well dressed thanks to the lovely gifts from my family - the shirt and top in the photo are from Roma. I also have David McCullagh's "The Reluctant Taoiseach" to look forward to. We went to mass today in our local church - Guardian Angels in Blackrock. I was delighted to see that technology has arrived to religion - a projector beamed the words of all the hymns onto a screen behind the altar. It was like being in Croke Park when the national anthem is being sung while the words of Amhrán na bhFiann are displayed on the big screen. We were all able to sing along. Of even more interest is the fact that a webcam was beaming the entire ceremony over the web - Fr Leycock assured us that several people would be watching on-line. Guardian Angels live web feed can be viewed here. Now it's downstairs to help with the final preparations for Christmas dinner - we are late eaters in our house. Best wishes to everyone, and God Bless us All!